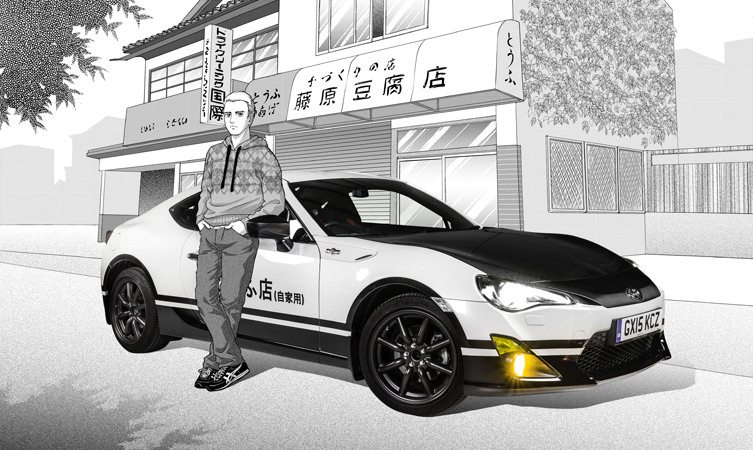 Inspired by the Initial D Japanese manga comic series, Toyota’s GT86 project re-imagines the world-famous AE86 Corolla for a new generation. On its launch in 2012, the Toyota GT86 was instantly recognised as a spiritual successor to the rear-wheel drive Corolla GT Coupe – also known as the AE86 – of the mid-1980s. That connection has been re-emphasised with the creation of a one-off GT86 Initial D concept, liveried and kitted to match its comic book Corolla predecessor. 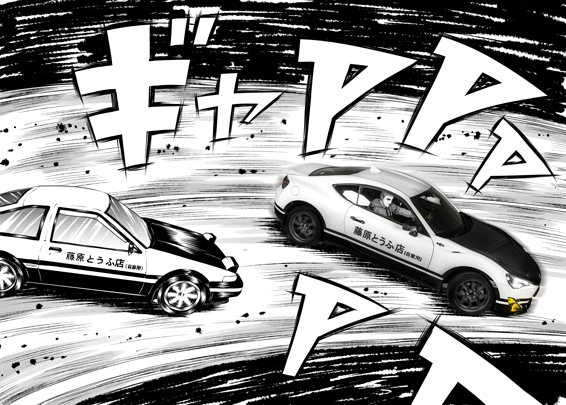 Initial D was a cult Japanese manga comic series in which the young hero, Takumi Fujiwara, famously drove a modified AE86, honing his driving skills on mountain roads while moonlighting as delivery driver for his father’s tofu shop. The car emerged as a star in its own right, influencing the emerging drifting scene and inspiring a live action movie and various arcade games. 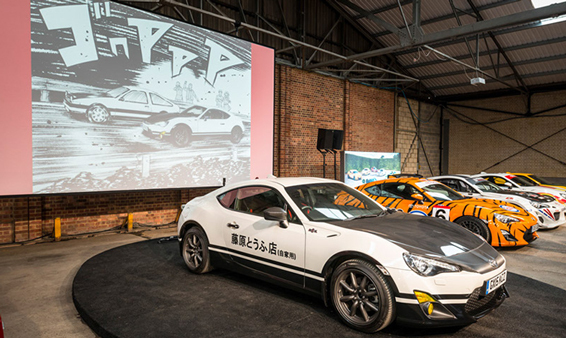 To emphasise the new concept’s roots in pop culture, Toyota commissioned UK-based manga artist Sonia Leong to design a series of panoramic backdrops that effectively put the real GT86 into comic strip action scenes. Sonia has previously applied her graphic skills to create a manga film featuring the Toyota Aygo. Created by Toyota’s UK special projects department, the GT86 Initial D concept is a faithful re-imagining of the fictional AE86. The coupe not only copies the manga car’s distinctive panda-style monochrome livery but uses new versions of the same Japanese market components that were featured so successfully on the original. These include custom-made RS Watanabe alloy wheels, TRD suspension, a Fujitsubo exhaust system, Cusco strut brace, and a carbon fibre bonnet. Less obvious cues are the yellow-tinted fog lights, which hint at the Cibié spotlights fitted to improve Takumi’s night-vision, and the silver-painted engine cover that is a nod to the high-revving 20-valve ‘Silver Top’ 4A-GE engine installed during the series. The thorough makeover is also evidenced by the inclusion of carbon fibre door handle protectors and mirror covers that give an effect similar to the black plastic material used on the AE86. In addition, mud flaps have been installed because they were on the original Initial D car, the boot lid spoiler has been removed, and the rear lenses have been tinted. The text on the driver’s door reads Fujiwara Tofu Ten, which translates as ‘Fujiwara Tofu Shop’. The word in parenthesis is jikayou, which means ‘private’ and refers to the car’s classification in the Japanese tax system. Joe Clifford from the special projects team commented: “Right from the start, the Toyota GT86 was developed as a car that would appeal to enthusiasts, whether in standard trim or as an exploitable base for further modifications. Really love Initial D comic, cartoon and movie; Oh those good old days! 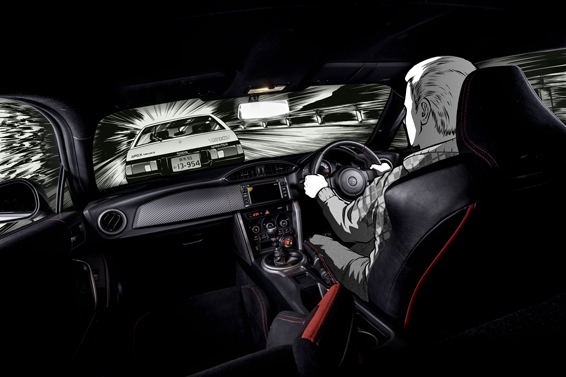 This GT86 Initial D Concept bring back all the memories….great! Thank you TOYOTA UK special projects team. Thank you for these comments, it’s great to see your enthusiasm! where can you find more pictures in detail of this replica??? Thank you for your interest in the Initial D Concept. You can find more pictures via this link: https://www.flickr.com/photos/toyotauk/albums/72157673765910945. This is pretty much my dream car. I assume it never made it to production? Thanks for getting in touch. 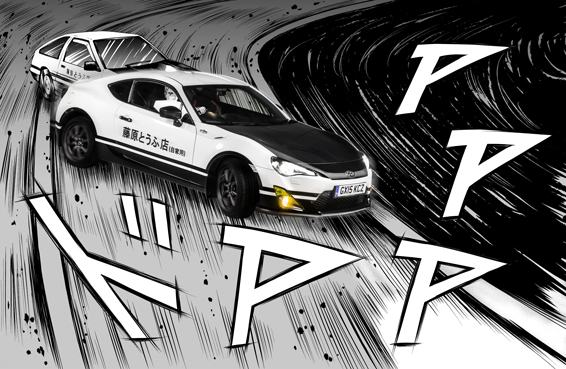 The GT86 Initial D concept is a faithful reimagining of the fictional AE86 from a cult Japanese manga comic series and it hasn’t made it to production. I think this looks outstanding. A working mans car. Thank you for for your kind words. Beautiful body work and great mods. Where can one get the carbon fiber bonnet? And also the mirror covers and mud flaps? Thanks. Beautiful Initial D concept car! love the comic & cartoon as well! Thanks for this lovely feedback. We’re glad you like it.